1963 Topps Astronauts is a historical look at the beginning of the space travel in the United States. Long a topic of fantasy, the 1960s saw it become a reality. 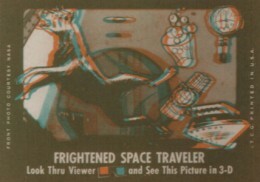 While the set focuses most prominently on the historical background of the space program, it also blends in elements of fantasy through illustrations used on the 3-D card backs. The 55-card set looks at the Project Mercury program, which was the American side of the space race with the USSR. Running from 1959 to 1963, it saw the first Americans reach outer space and orbit the earth. Cards go relatively in depth, at least as far as a small set of trading cards can, into the key astronauts in the program, their training and the gear they used. In particular, Alan Shepard, John Glenn and Virgil Grissom figure prominently in the set. Scott Carpenter, Gordon Cooper, Walter Schirra and Donald Slayton are other astronauts to appear on the checklist. President John F. Kennedy is also on a card. 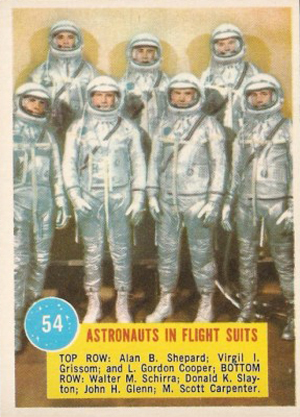 1963 Topps Astronauts card fronts are dominated by a photo. Most showing training exercises, although machines and astronaut portraits are also included in the artwork. The bottom of the card has a yellow box that holds a red headline caption and a short description. The corner of the box has a moon icon with the card number inside. Card backs are very different. They have a 3-D illustration. They aren't focused so much on Project Mercury. Instead, they imagine some of the feats humans might be able to accomplish through space travel. It's a sci-fi turn for a set that is otherwise based in reality. A pair of 3-D glasses comes in every 1963 Topps Astronauts wax pack. 1963 Topps Astronauts Popsicle Backs are a rare variation on the set. Instead of a 3-D image, the cards have a blue back with several space-themed illustrations like stars, planets and a rocket. 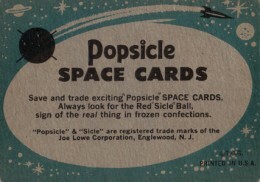 The middle of the card includes an ad for Popsicles from the Joe Lowe Corporation. Popsicle Backs are more difficult to find than the 3-D backs and command a premium on the secondary market. 1963 Topps Astronauts — Grissom In Pressure Suit #24 — PSA 6. Beautiful Card! 40 PHOTOGRAPHS AND ILLUSTRATIONS IN FULL COLOR….HUNDREDS OF INTERESTING FACTS AND IDENTIFICATION AND INFORMATION. THESE 40 I.D. CARDS TELL THE STORY OF THE ASTRONAUTS, ROCKETS AND SATELLITES IN THE ERA OF EXPLORATION. Copyright 1963 by McGraw-Hill Inc. I would like to sell them. Please contact me via e-mail if interested.